This black bean soup is comfort food in a bowl. Made with an entire pound of bacon, this scrumptious soup can be served with toppings or plain. I know what you’re thinking. Does this black bean soup really need an entire pound of bacon in it? The answer is yes. A thousand times, yes. Never in your life have have you had a black bean soup with this much bacony flavor. It is so luscious and dreamy that the stuff you get out of a can will never compare to this black bean soup recipe. This soup is the epitome of comfort food. I mean, how can you go wrong with bacon, right? And since it isn’t heavily spiced, but rather focuses on the bacon, it is great in any season. Can I Used Canned Beans For Black Bean Soup? A fifteen ounce can of black beans has slightly less than two cups of cooked beans. The one pound bag of dry beans that this black bean soup recipe calls for yields about seven cups. If you want to replace the dry black beans with canned, you’ll need four cans to make the recipe work. Plus, with canned beans this black bean soup takes about an hour less to make. Be careful with your salt amounts though. Canned beans have salt added to them, so you want need to add as much at the end. Can Black Bean Soup Be Frozen? Yes! This black bean soup freezes extremely well, and can stay frozen up to six months. Just don’t be turned off by the congealed bacon fat. Since it isn’t strained out, the fat will create a thick coating around the black bean soup. This also means that whatever container you are using will need to be thoroughly scrubbed after using the soup. If you’re freezing this soup in a Ziploc bag, I recommend filling it then laying it flat. Spread the cooled black bean soup out so that the entire bag is filled. Remove any air and freeze flat like this. It will make it easier to fit in your freezer. This black bean soup recipe is super simple. The important thing to focus on is to soak your beans overnight. It used to be said that soaking the dry beans would eliminate flatulence. However, there has been a lot of research done recently on whether or not it actually matters. Regardless of the reason, soaking them overnight DRASTICALLY cuts down on your cooking time. By around two to three hours. Additionally, soaking the beans helps strain out excess starch, impurities, and saves you money on chicken stock. 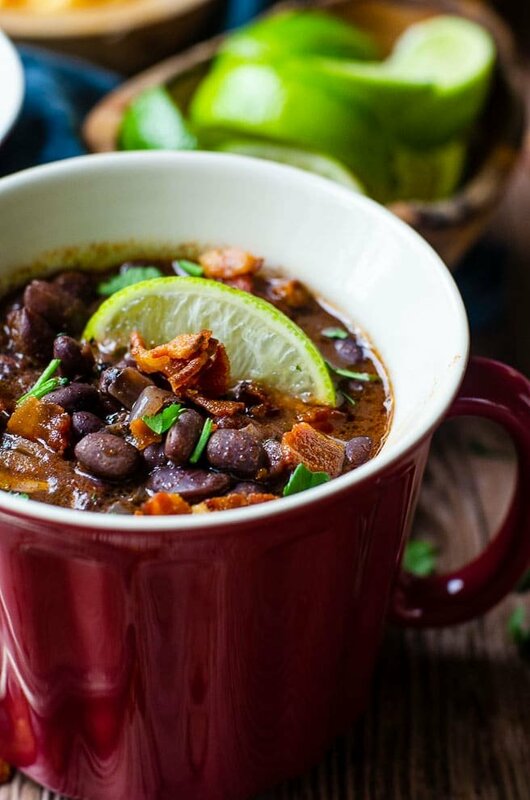 For some other tips on how to make black bean soup from scratch, check out these helpful cooking techniques. Why Soaking Beans Matters. This explains in detail how to soak beans overnight, as well as the quick soak method. How To Buy & Store Bacon. If you’re dithering at the store about what kind of bacon to buy, or how thick it should be cut, this explains it all. Additionally, it covers all the important details about curing. Homemade Chicken Stock. If you want the entire black bean soup recipe to be from scratch, this recipe will give you a rich and flavorful chicken stock. This five part series also explains what the difference is between chicken stock and chicken broth. Dry Spices 101. This recipe uses ground cumin, chili powder, and oregano. If you haven’t gone through your spice cabinet in a while, this will help you determine freshness and quality. You don’t have to limit yourselves to these traditional toppings, though. You can also serve this soup with fresh tomatoes, rice, or corn. Personally, my favorite is a garlicky cheese quesadilla. I use it like naan and scoop up the black bean soup with them! Currently, this black bean soup recipe is very mild. Mostly because spicy peppers would overpower the bacon. Does that mean that it can’t be spicy? Absolutely not. If you would like to add a little heat to this black bean soup, simply replace the poblano with your preferred spicy pepper. Can I Make This Black Bean Soup Creamy? Happy National Soup Swap Day! This recipe is brought to you as part of a collaboration with other food bloggers for National Soup Swap Day. If you want to check out some of the other delicious recipes, you can check them out below. Thank you to Kate from Kate’s Recipe Box for putting this together! If you don’t often cook with dried black beans, then you may find you want to jump the gun on eating this soup. However, it is extremely important that taste test your bean to make sure they are ready to eat. If you strictly follow my recommendations for cook time, your beans may not be done. When they are finished, they should be tender but not busting out of their skins. This soup is also wonderful for making large batches. However, make sure that you have enough space in your pot to stir easily. If you can’t effortlessly stir the soup, you’ll end up with sections of beans that are still al dente, while others are overcooked. Want a free printable grocery list for this black bean soup recipe? Get it HERE. Use this grocery list to help simplify shopping. Everything is listed in standard grocery store amounts. If no size is specified, even the smallest package will provide more than enough. 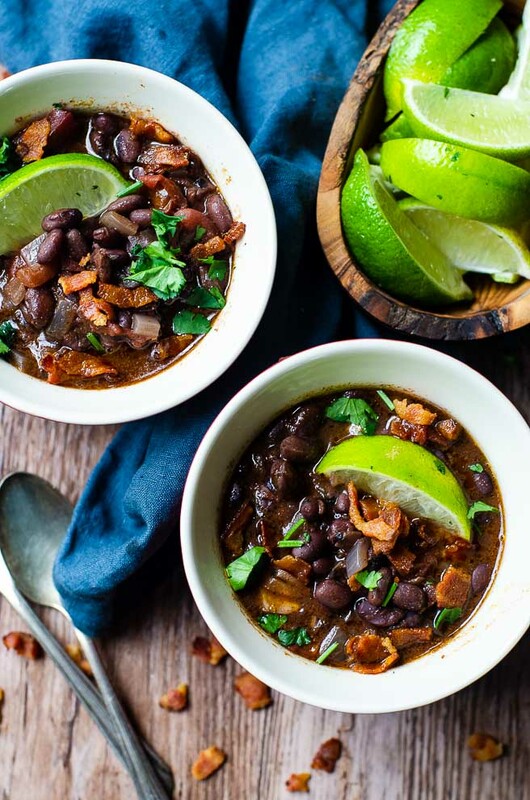 This comforting bowl of black bean soup is filled with a pound of bacon! Serve it with some garlicky cheese quesadillas for a delicious dinner! In a large pot, cook the diced bacon over medium heat until the bacon is crispy. About 10 minutes. Strain out the cooked bacon, but leave the bacon fat. Sauté the onion, garlic, and poblano pepper until the onions begin to turn translucent. About 5 minutes. Stir in the fire roasted tomatoes, chicken stock and spices. Bring the soup to a boil then reduce the heat to a simmer. Cover the pot and let it simmer for one hour, or until the beans are tender. Stir in the diced red bell peppers and reserved cooked bacon and cook for five more minutes. Season with salt and pepper and serve with a lime wedge. This looks delicious and so flavorful! Love the crispy bacon! Me too! I like that it gets stirred in at the end so the bacon doesn’t get overly mushy and lose its texture. I love black bean soup. Yours sound so good with all that bacon! That soup is gorgeous. I love all of that bacon in there! Perfect for a winter day. I love anything with black beans! This soup looks so nourishing and delicious! Me too! 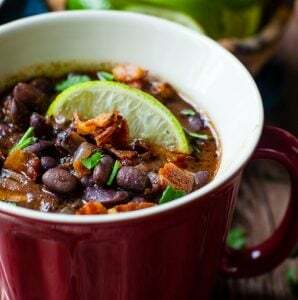 Black beans are one of my favorite foods, and this black bean soup is perfect comfort food! Delicious, hearty, and healthy plus there’s bacon! You can never go wrong with bacon! This sounds delicious and I love the fact that it is not pureed. Oh, I LOVE the addition of bacon here! So good! Thanks for celebrating National Soup Swap Day with us! What a great weekend soup…soak the beans on Friday night…and then, start making it on Saturday! Yes! It’s so delicious and comforting! I have been looking for a good Black Bean Soup! Love that you have instructions for both dry and canned beans. Sometimes in a rush, I need to use canned. This is a soup I am adding to my families meal rotation and its a great soup for the hubs to bring in his thermos for work too! We all have those days where we forgot to soak the beans or just need the recipe to be done quickly. I keep lots of extra cans of black beans in my pantry just in case. I love love love black bean soup and adding bacon?! yes please! I never had black bean soup so this is quite novel to me. Would love to try it, thank you for inspiring me to make something new! It’s so good, Eva! I hope you love it! I really can’t get enough soup and anything with bacon in it is amazing in my book! Can’t wait to try. I’m on team “better with bacon” as well! I hope you love it! 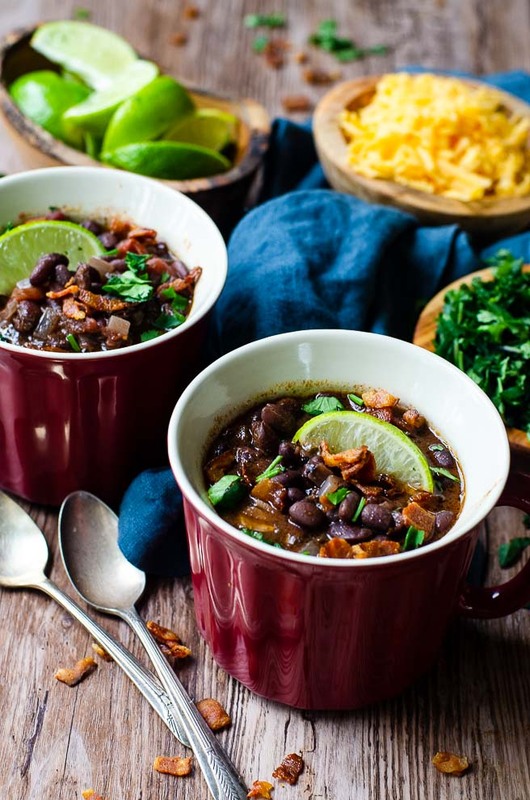 I love black beans just cooked….so I know I would just chow down on this soup!